Photo by Ellen Terich used with kind permission. 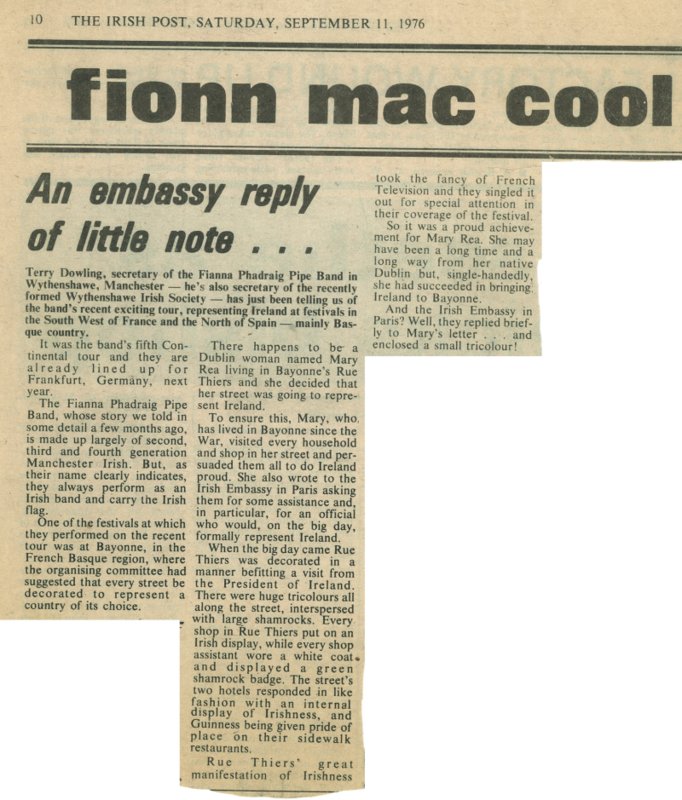 In 1966, the Band travelled to Dublin to take part in the events organised to celebrate the 50th anniversary of the Easter rising. 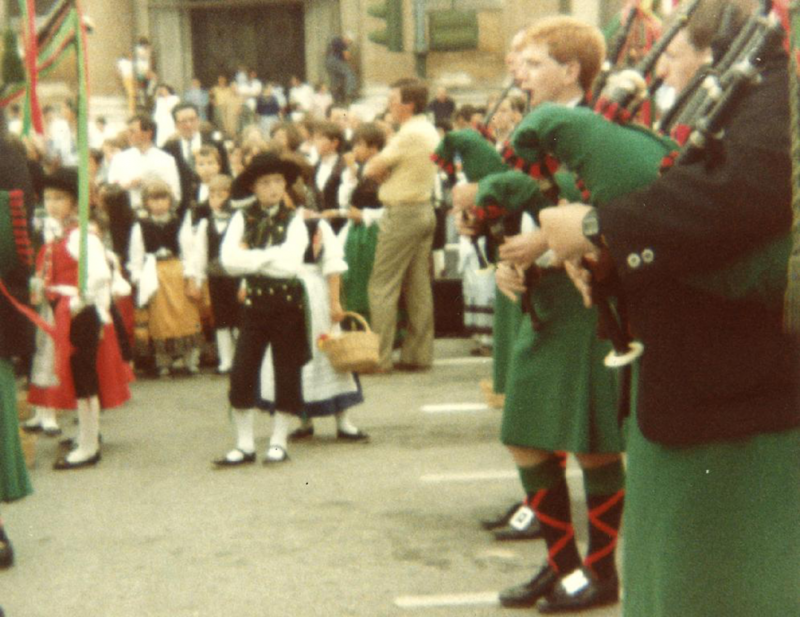 Due to scheduling difficulties, the Band was unable to take part in the parade as planned. Bill Lisgo, who was just 18 years old at the time, remembers that Pipe Major Terry Dowling, who was never one to miss an opportunity, read in the local press that Irish President Eamon de Valera was due to open the exhibition organised by the Kilmainham Gaol Restoration Society in the gaol's East wing as part of the 50th anniversary celebrations. In no time at all, Terry marched the boys down to Kilmainham, only to be told in no uncertain terms by the Gardaí on duty that the Band's unscheduled presence was not required. Amidst the confusion, an official limousine pulled up. The rear seat passenger dropped his window and asked the Gardaí what was going on. 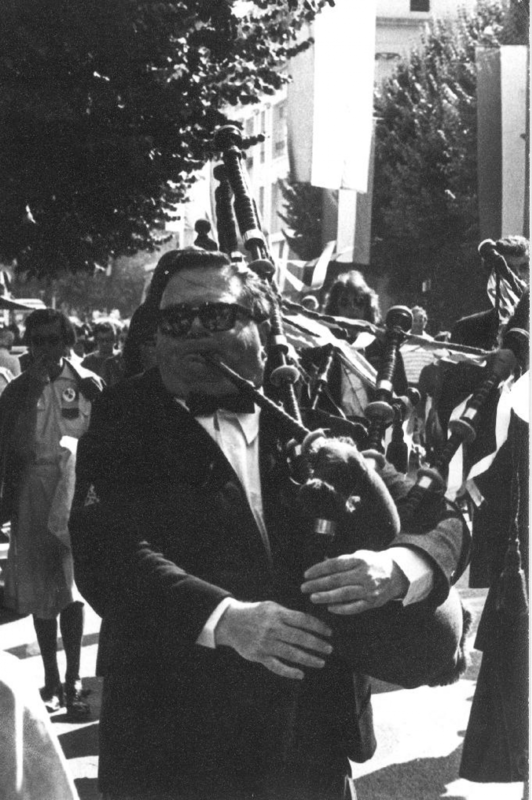 When he heard that the cause of the commotion was an Irish pipe band who had travelled over from Manchester to perform at the Easter Rising celebrations, his reply was short and sweet: "Let them play!". 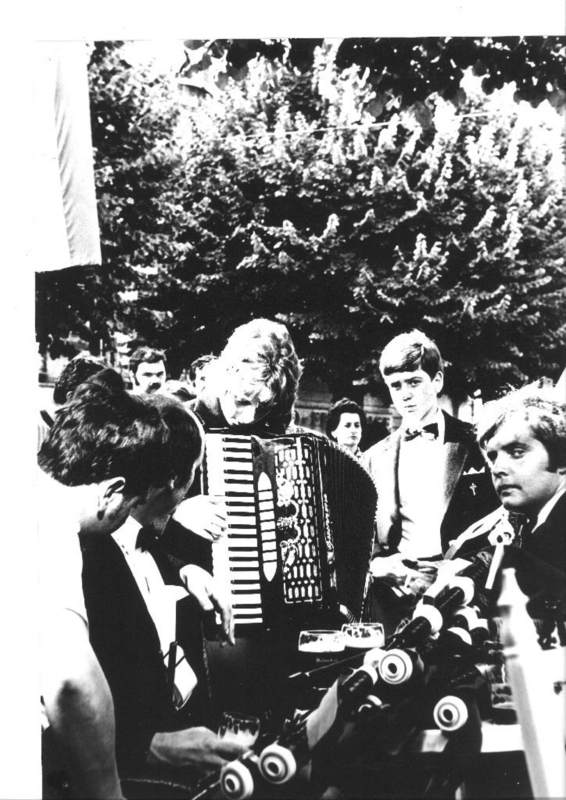 The Band promptly formed up and the limousine drove off into the gaol to the sound of A Soldier's Song, played by a band of second and third-generation Irishmen from Manchester. 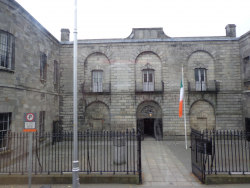 The limousine's rear-seat passenger was none other than Eamon de Valera, former occupant of Kilmainham Gaol and President of the Republic of Ireland. 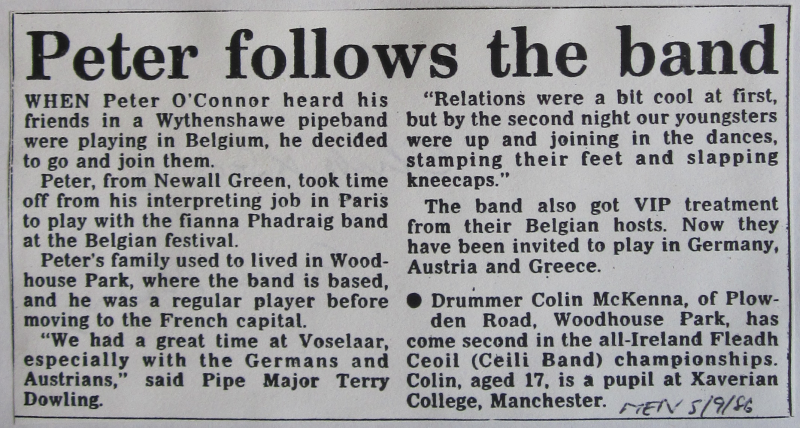 We had no idea that there was any trace of the Band's participation in this historic event... until recently, when drummer Bill Hennessy came across this little gem on the Internet. It's a living record of a defining moment in the life of the Band and confirmation that the story related above really is true, give or take a sprinkling of poetic license!!! Family Mystery to Family History by Ellen Terich (http://ellenterich.blogspot.fr/2012/08/ireland-part-i.html). Check out Ellen's blog recounting her trip to Ireland in the footsteps of her great great grandfather who emigrated to the United States in the second half of the 19th Century. 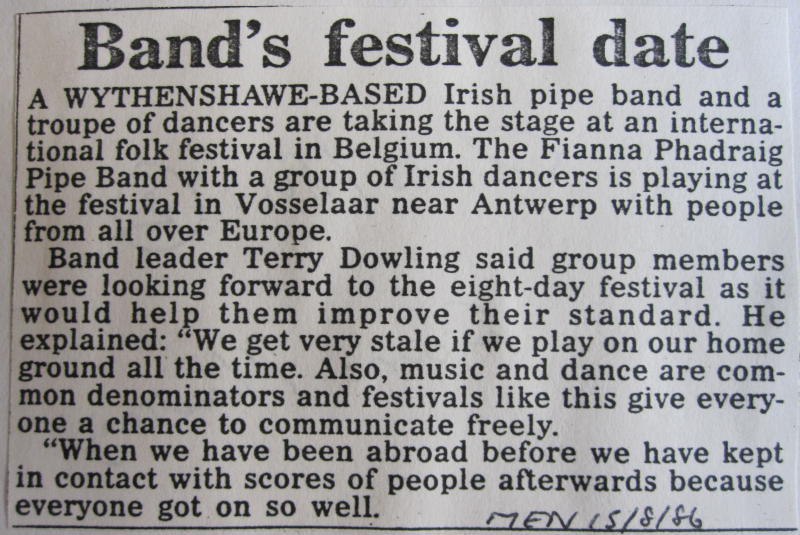 In 1969, Terry Dowling was contacted by Phil Conroy, a head teacher from Sunderland who was also one of the founders of the Billingham International Folklore Festival and General Secretary of the International Council of Organizations of Folklore Festivals and Folk Arts (C.I.O.F.F. ), a non-governmental organization of UNESCO. 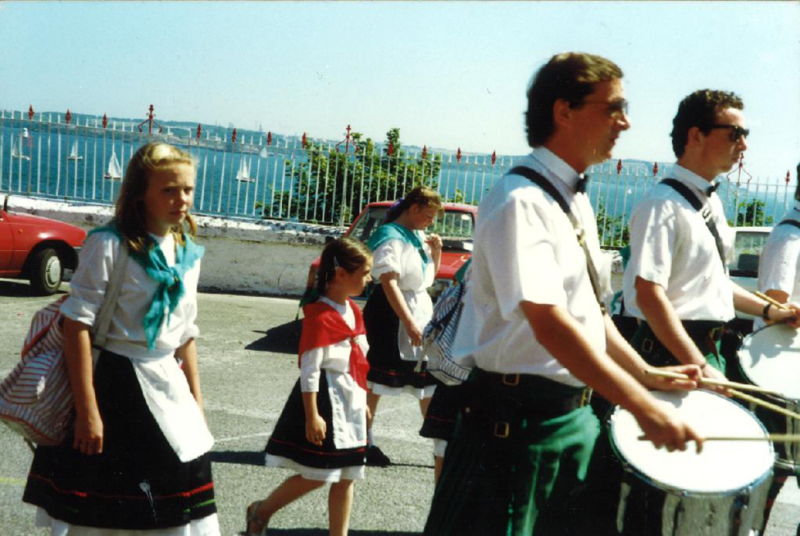 Mr. Conroy was looking for an Irish pipe band to partner his own Irish dancing troupe, St. Leonard's Irish Dancers from Sunderland, during a tour of festivals in Tarcento, Italy and Challes-les-Eaux, in Savoie, France. 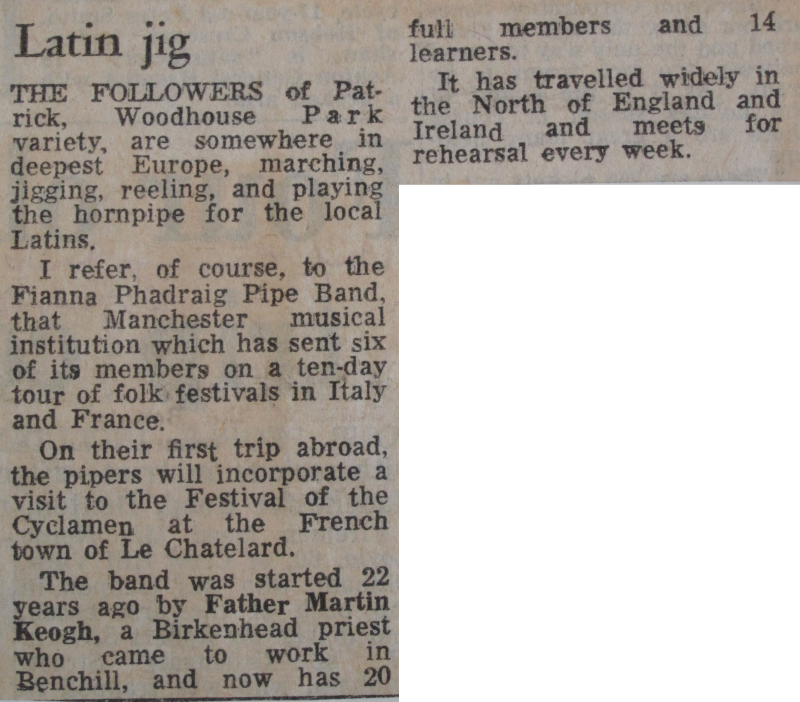 The Manchester contingent comprised Terry Dowling, Bill Lisgo, Peter Cummins and John Hyland on the pipes, alongside Eamonn O’Neal on the accordion and his cousin Gerard Traynor on the tin whistle. Eamonn and Gerard provided the accompaniment for the dancers during the performances. 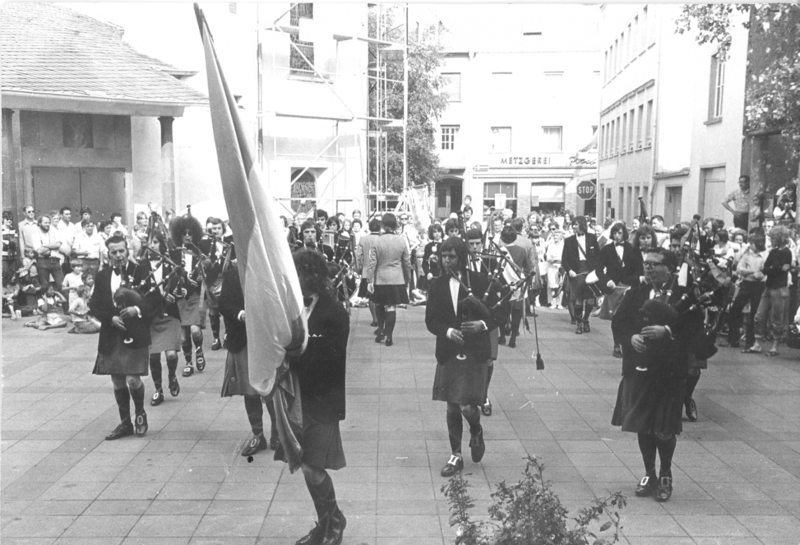 On parade, meanwhile, Eamonn led the contingent as flag bearer and Gerard carried the St. Leonard's dance school banner. 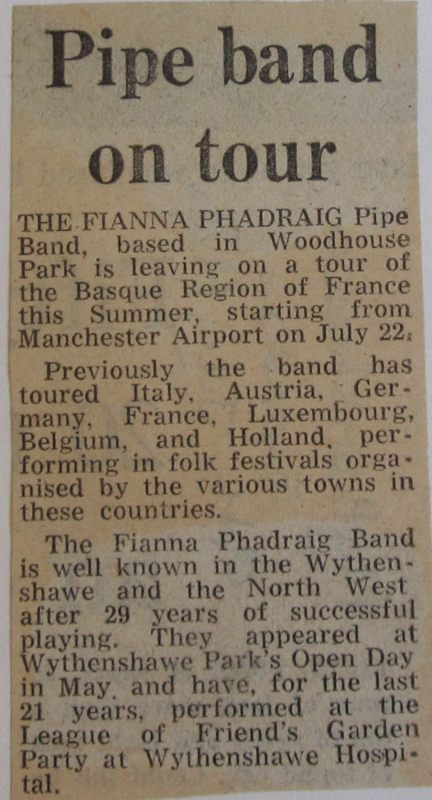 Six members of the Fianna Phádraig Pipe Band, from Woodhouse Park, returned this week from a tour of Italy and France, where they took part in four local festivals. 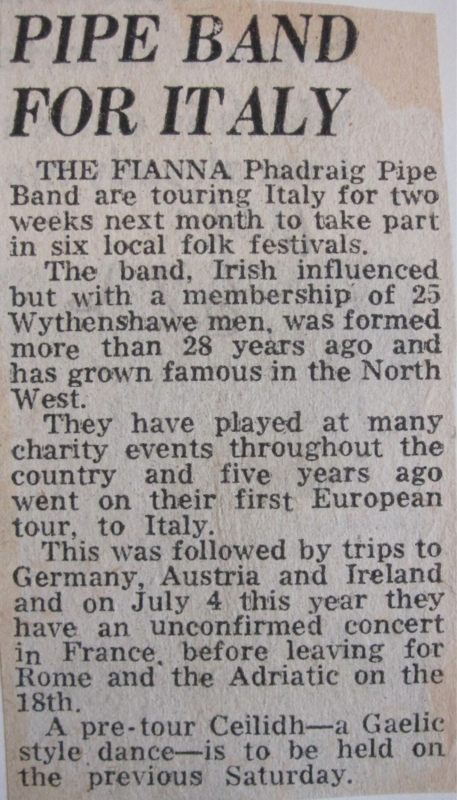 The members, Bill Lisgo, John Hyland, Peter Cummins, Eamonn O'Neal, Gerard Traynor and Terry Dowling, joined a group of 40 from Sunderland for a "holiday with a purpose, meeting people of other countries though music and song". After an uneventful trip which took them through Ostend and Brussels in Belgium, to stay briefly in Augsburg in Germany, they travelled through Austria to the first of the festivals in Tarcento, Italy. Here they stayed for five days, taking in another festival in Udine, which is the capital of the old Venetian State. The performance here took place in a villa in which Napoleon signed one of the last treaties of the Napoleonic wars. 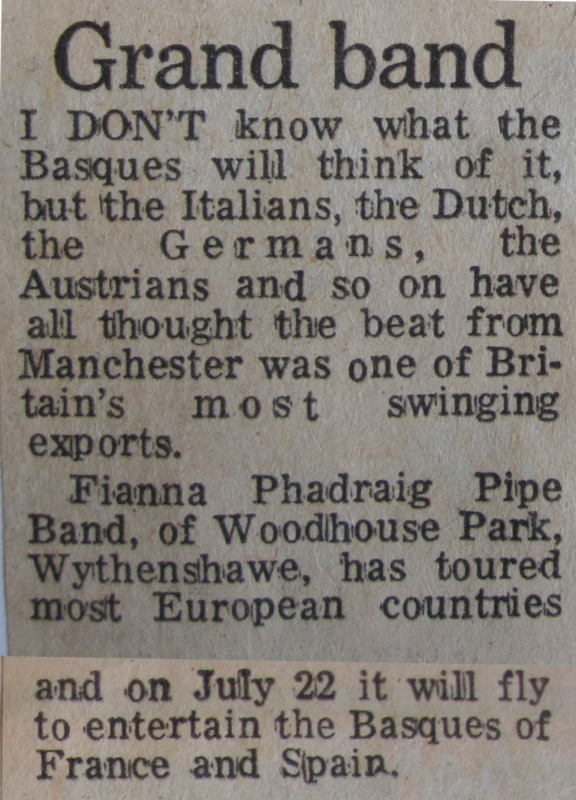 "Here in Italy were groups from the Congo, Germany, Hungary, America, France and Italy itself", said Terry Dowling, who is leader of the Pipe Band, as well as manager of the Wythenshawe Social Centre, Brownley Road. "The friendly atmosphere was terrific, and despite the language barriers many names and addresses were exchanged." From here, the British party moved up to Lake Maggiore in the Italian Alps for a short rest. Here they spent two days relaxing, swimming and taking in the beauties of the local countryside. The tour continued then through the glorious Swiss Alps, where the party took lunch in a small village right in the heart of the mountains. In Challes-les-Eaux, the venue for the next festival on the list, they were met by the Mayor and entertained at various hotels in the town before giving an evening performance. On Sunday, a Folk Mass was sung by the British party in the parish church of Le Chatelard, which is about 20 miles from Challes-les-Eaux. This was the start of the festival of the Cyclamen, a local flower which blooms at this time of the year. Here the performance was given in the open air, together with groups from other parts of France and Italy. After being royally entertained by the Mayor and local Councillors, they travelled back to Challes-les-Eaux for the evening. 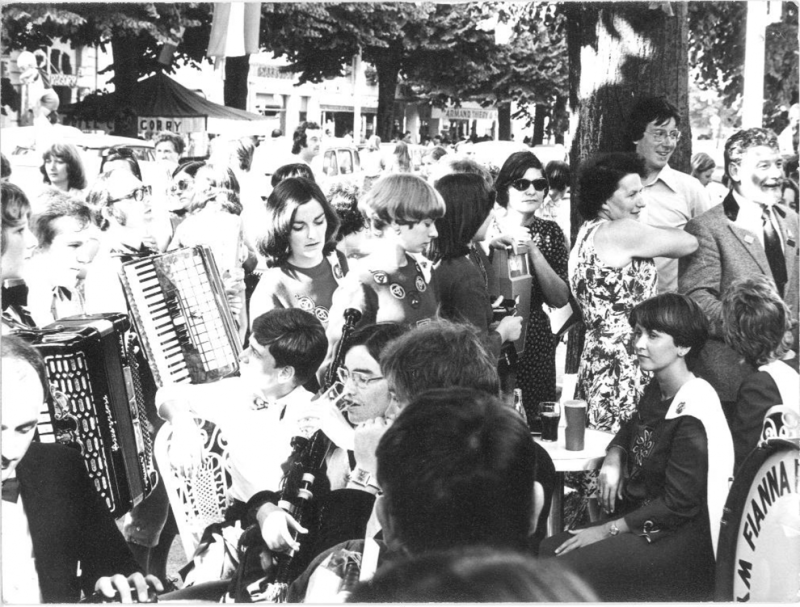 Check out below a selection of photos from Tarcento in 1970. 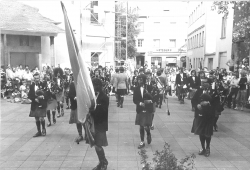 In 1972, the Band returned to Europe, once again with the St. Leonard's Irish Dancers, but this time on a tour of Festivals in Germany and Austria. 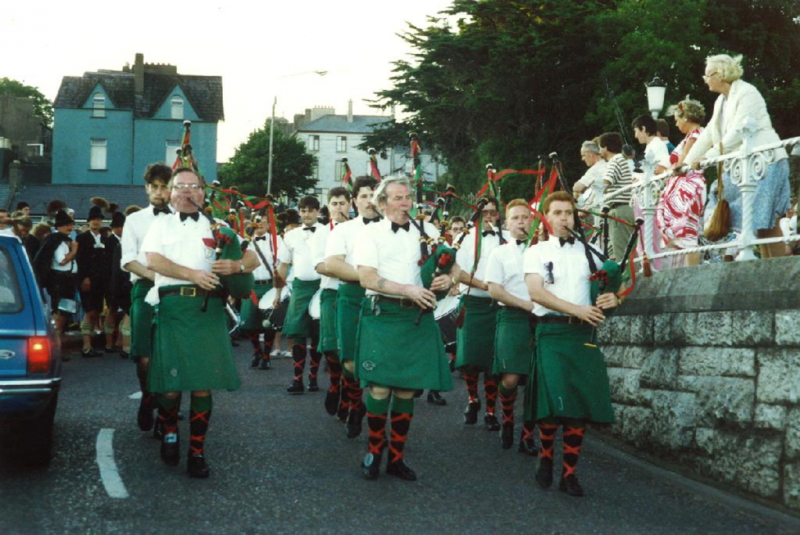 Pipe Major Terry Dowling headed a full band of pipers and drummers, while Eamonn O'Neal once again accompanied St. Leonard's dancers on the accordion and carried the tricolour on parade. 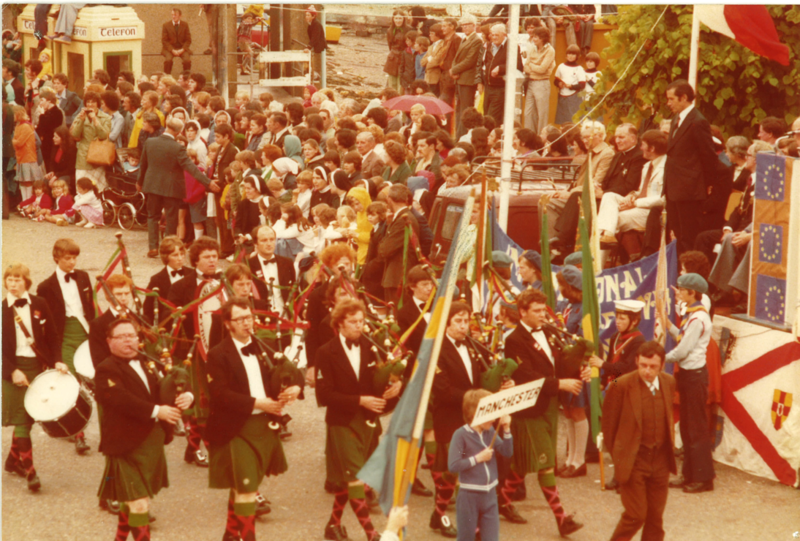 In 1974, the Band travelled to Galway for a long weekend performing at the St. Patrick's Festival, under the sponsorship of Bord Failte and Joe Walsh Travel. For some of the younger band members, this was the first experience of air travel and there were a few nervous faces, my own included, as we walked across the tarmac at a rain-soaked (of course!) Manchester Airport to board the Aer Lingus 737 which was to take us to Dublin. After a rather bumpy flight, we arrived in the Irish capital - everything intact except for the pride of one or two lucky recipients of the airline's handy barf bags - and boarded the coach waiting to take us to Galway City. After an early stop-off for liquid refreshment and a last-minute addition to our jolly band in the person of a young friend from Dublin who had decided that a weekend in Galway with the Irish pipers and drummers from Manchester was just what he needed, we headed off along the old Dublin-Kinnegad-Galway road. A few hours later we arrived at the Lough Corrib Hotel in Galway. My own memories as a young teenager are quite clouded. 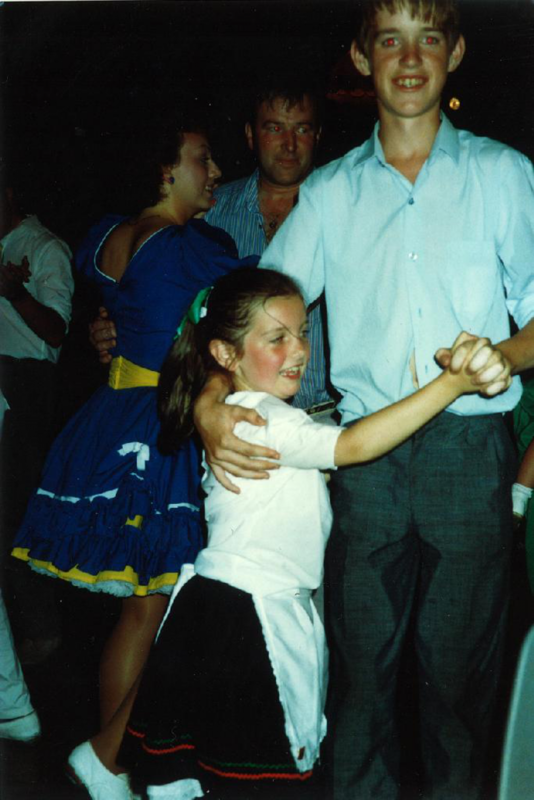 I recall an evening - probably our first in Galway - in a crowded, smoke-filled club, with a mixture of session music and Irish country and western songs being bashed out by a whole range of musicians and singers. 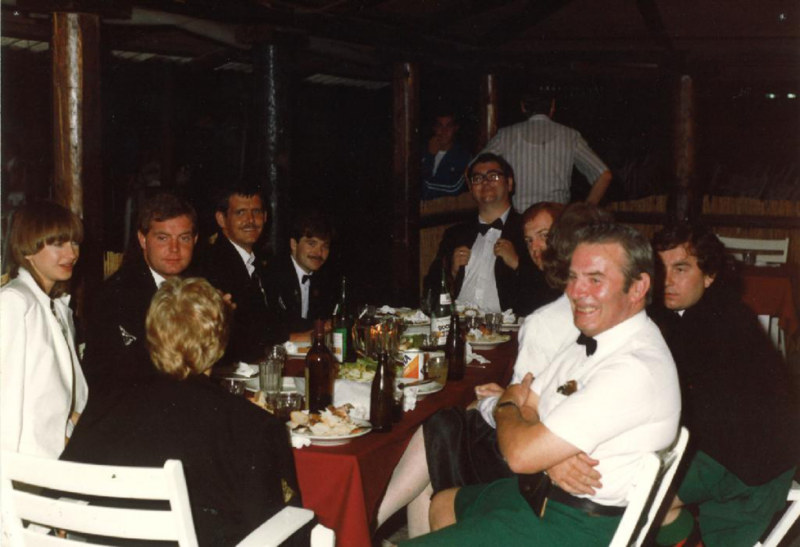 I remember dozing off at the table, exhausted after an early start and a long day, only to wake up to catch in mid-fall a full pint of Guinness which somebody had just nudged off the table in front of me! I can also remember forming up, the following day, on a large square in Galway city centre to set off on a St. Patrick's day parade. 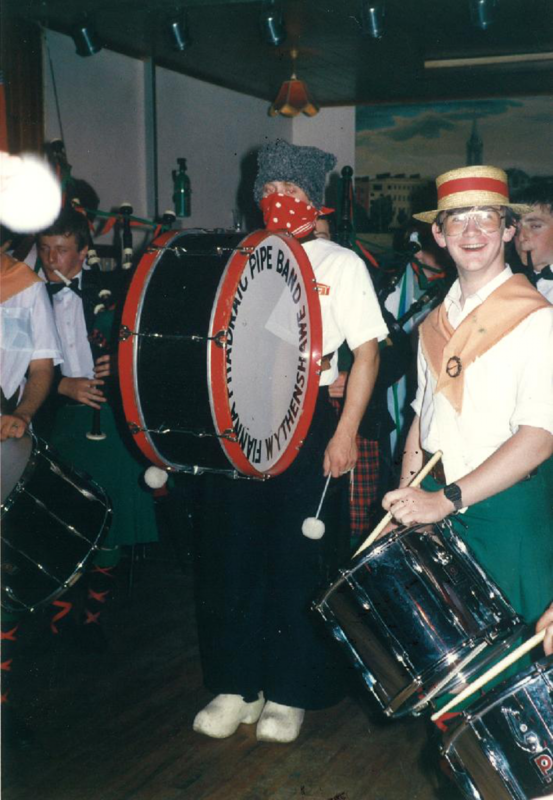 As with many of these events which took place more years ago than we care to remember, we're counting on you, current and former band members, band members' families and friends of the Band, to fill in the gaps with more factual content, anecdotes and any memories you wish to share. 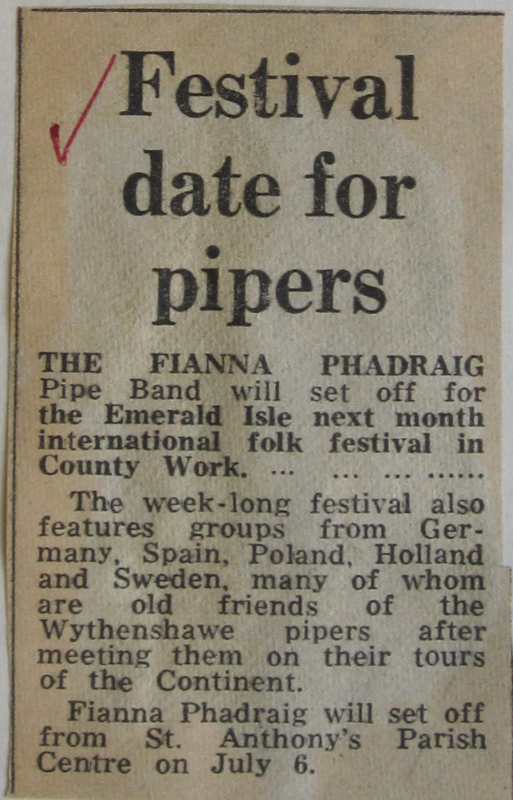 In 1975, the Fianna Phádraig Pipe Band and St. Leonard's Irish Dancers embarked upon another European tour, this time to Italy. Our first port of call, after landing at Rome's Leonardo da Vinci airport where we were greeted by our guides, Silvio and Franco, was the town of L'Aquila, perched on a hillside in a narrow Appenine valley surrounded by four mountain peaks. The ninety-minute coach ride from the Italian capital provided a continuous flow of stunning natural scenery and architectural beauty. In L'Aquila, we gave four concerts, representing Ireland, alongside groups from Bulgaria, Romania, Poland, Belgium and Greece, and had the privilege of performing in front of the magnificient San Bernardino Basilica. After L'Aquila, we headed off to Lanciano, on the Adriatic Coast, for two days of concerts in arenas and stadiums buzzing with the enthusiasm of the Italian crowds. One image that comes to mind all these years later is that of the political posters covering the outside walls of the different venues. What was perhaps striking for a young lad from Manchester, an avid reader of Giovanni Guareschi's "Little World" tales relating the story of a small town priest in Northern Italy, constantly at odds with the town's communist mayor, was the overwhelming visibility of the Italian Communist Party - a rare sight on UK streets at the time. During our stay in Lanciano, I half expected to stumble across Don Camillo and Peppone settling their differences in a bout of fisticuffs! After two days in Lanciano, we headed back Westwards. En route to Civitavecchia to catch our ferry to Sardinia, we hit the summer traffic jams, and as we arrived at the ferry port, somewhat behind schedule, we saw our ferry... sailing off over the horizon. Fortunately, we were able to take a later departure - without our coach! - and after an 8-hour crossing we arrived in Sardinia, with our now redundant coach driver, Umberto, in tow! Our accommodation was a vast Salesian college in the midst of a desert-like landscape remiscent of a decor from a Sergio Leone spaghetti western. We shared the spacious accommodation with the other groups performing at the festival and at the various events organised on the island. The performances in Sardinia were scheduled in the evening, due to the extreme summer heat. At each venue, mainly outdoor arenas, the atmosphere was unlike anything we had experienced on the Band's tours. When we arrived on stage, the crowd, seemingly several-thousand strong at each event, simply went wild. 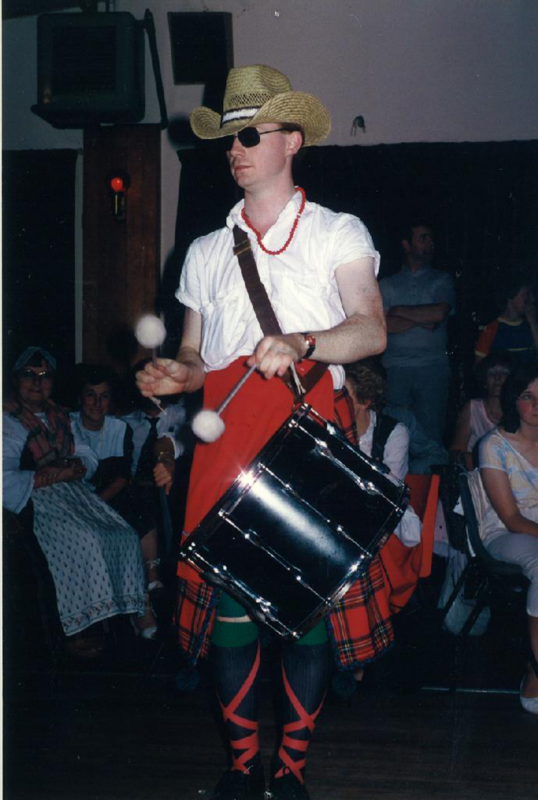 They were, of course, cheering the pipers and the side drummers, but the real stars of our show were our tenor drummers, Brendan & Martin O'Neill, and our bass drummer, Brendan Rea. 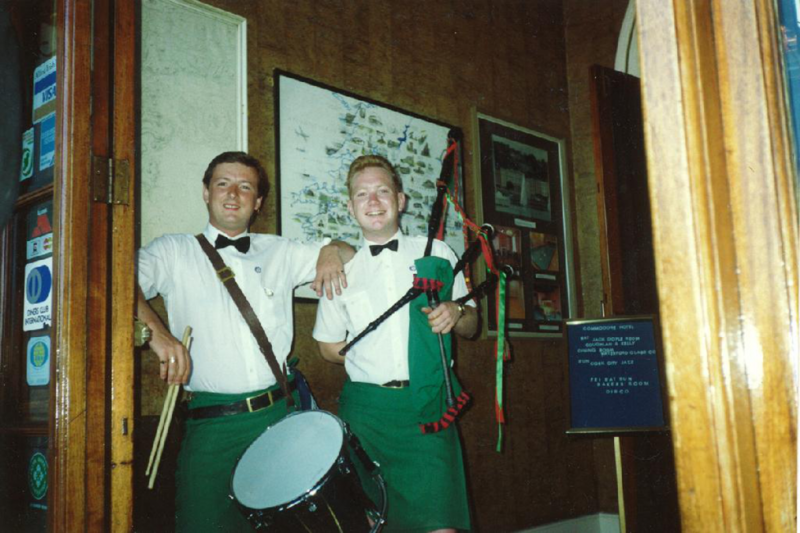 From the moment they started swinging their sticks, under the bright stage lighting in the arenas, we could hear the roar from the crowd rising above the sound of the pipes and drums. After one such performance, the Band and Dancers received an invitation, as guests of honour, to a banquet held the following day by the colonel in command of the local Carabinieri corps. The reception we were given was fit for a king, with food in abundance - including a local delicacy, "casu marzu", or, to you and me, maggot cheese (no explanation needed!) - and rosé wine flowing freely. 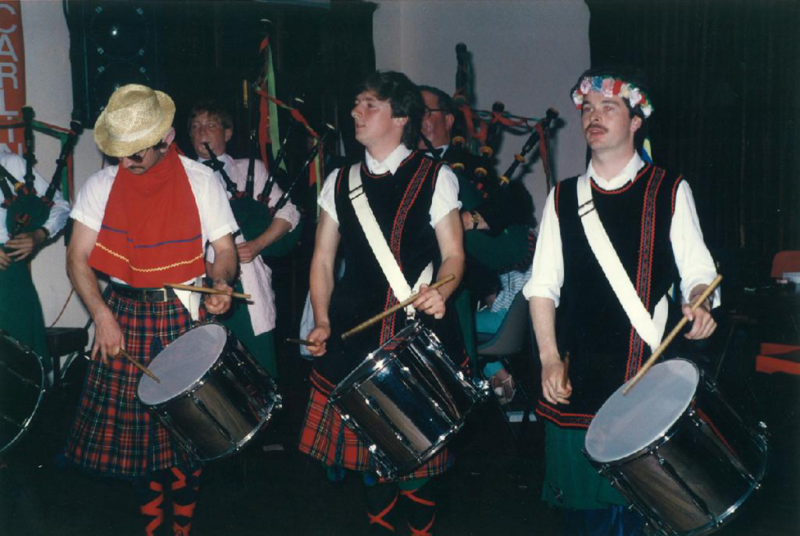 As the evening went on, the Band and Dancers were asked to perform . We willingly obliged, entering into a concert set which included a relatively intricate marching routine. Needless to say, we were all a little tired by then, but we nonetheless managed to pull off our precision marching display, nearly without a hitch! In any case, our gracious hosts were delighted with the evening and the Colonel in command made a point of congratulating us on our marching skills! On the Sardinia leg of our tour, as in L'Aquila and Lanciano, the enthusiastic reception we received at every venue was quite overwhelming. 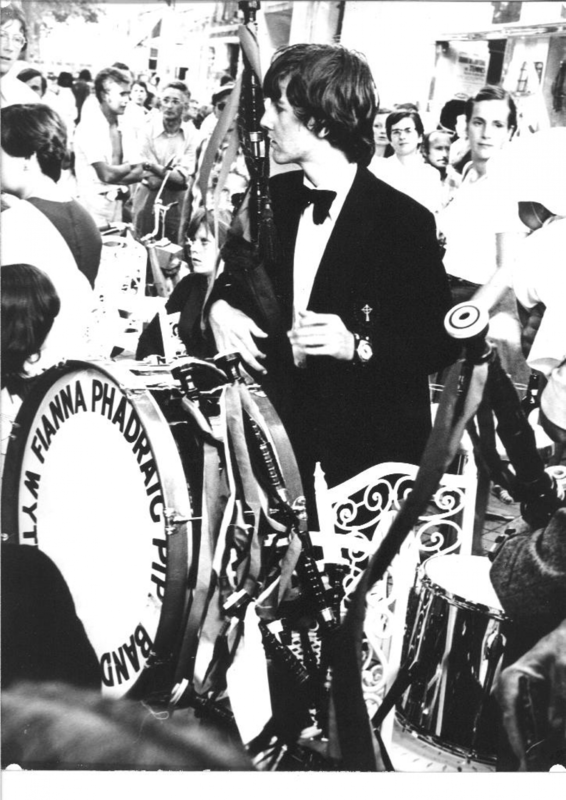 Indeed, the Band's performances were so popular in Italy that Terry was presented with a trophy, sponsored by Martini, as one of the groups with the greatest audience appeal! 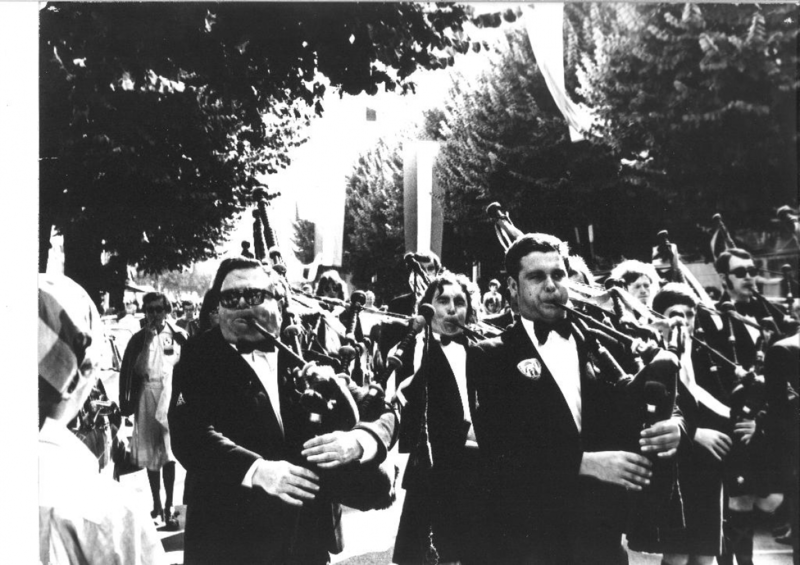 The Italian audiences certainly loved the Band, but there is no doubt that the Band loved the Italian audiences and the unforgettable reception they gave us! 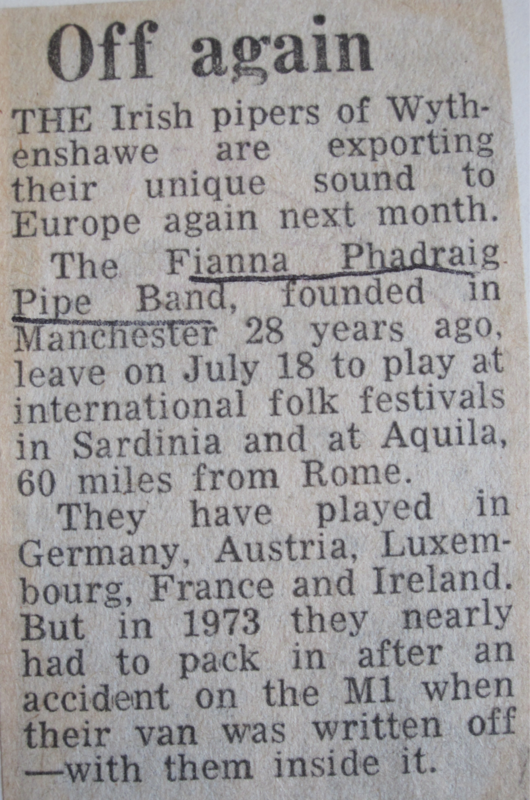 In 1976, we polished our drums & pipes and packed our bags again, for another trip, this time to France and, as we were to find out later, to Spain. Our travelling companions were, once again, our dear friends from the St. Leonard's Irish Dancers, with whom we share so many happy memories. After our short flight to Paris - Charles de Gaulle airport, where we were met by our guide, Geneviève, we boarded our coach and set off on a seemingly endless drive to Rochefort on the Atlantic coast. Little did we know that this "endless" drive was nothing compared with the little surprise our hosts had in store for us a little later into the trip. In Rochefort, we were billeted, yes, billeted! in an operational French air force base, complete with multi-bed dormitories and shared bathroom facilities. Our performances included a set at an event on the air force base and a short trip over to La Rochelle, where we played in front of the beautiful town hall, which recently suffered extensive fire-damage. From Rochefort, we headed down to Bayonne, in the heart of the French Basque region, to take part in the annual Fêtes de Bayonne, which traditionally take place over five days starting on the Wednesday prior to the first Sunday in August. 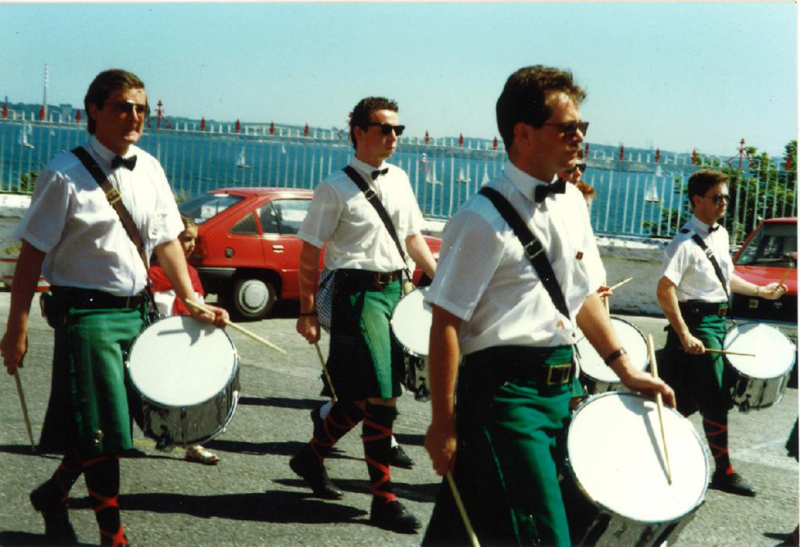 "One of the festivals at which [the Band] performed on the recent tour was at Bayonne, in the French Basque region, where the organising committee had suggested that every street be decorated to represent a country of its choice. There happens to be a Dublin woman named Mary Rea living in Bayonne's Rue Thiers and she decided that her street was going to represent Ireland. When the big day came, Rue Thiers was decorated in a manner befitting a visit from the President of Ireland. 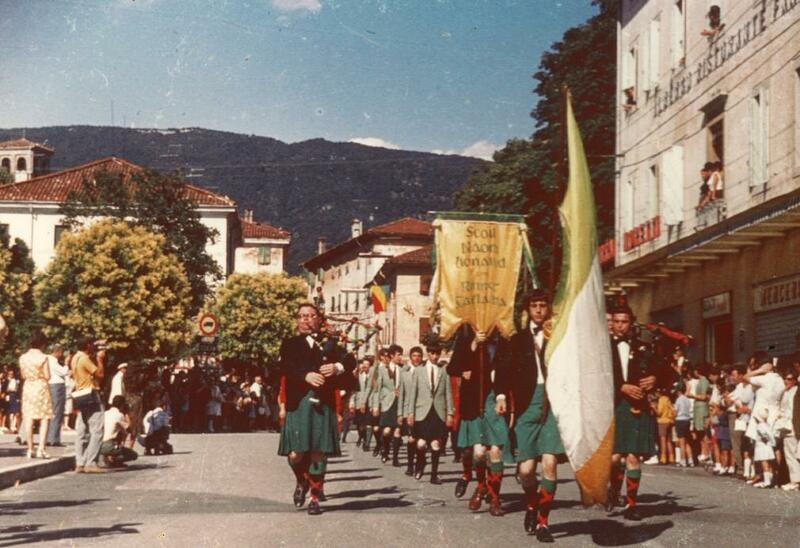 There were huge tricolours all along the street, interspersed with large shamrocks. 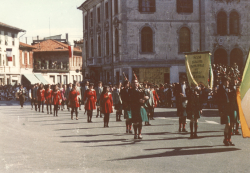 Every shop in Rue Thiers put on an Irish display, while every shop assistant wore a white coat and displayed a green shamrock badge. 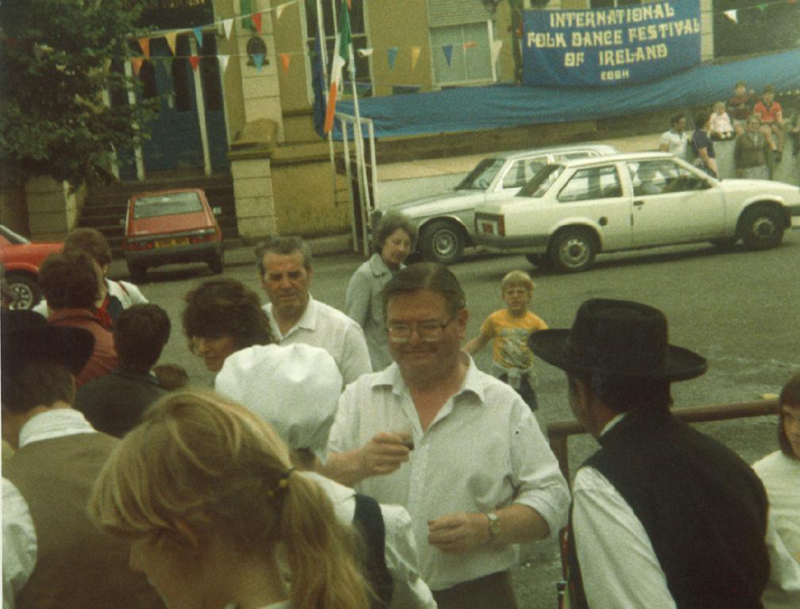 The street's two hotels responded in like fashion with an internal display of Irishness, and Guinness being given pride of place on their sidewalk restaurants. Rue Thiers' great manifestation of Irishness took the fancy of French Television and they singled it out for special attention in their coverage of the festival. So it was a proud achievement for Mary Rea. She may have been a long time and a long way from her native Dublin but, single-handedly, she had succeeded in bringing Ireland to Bayonne." 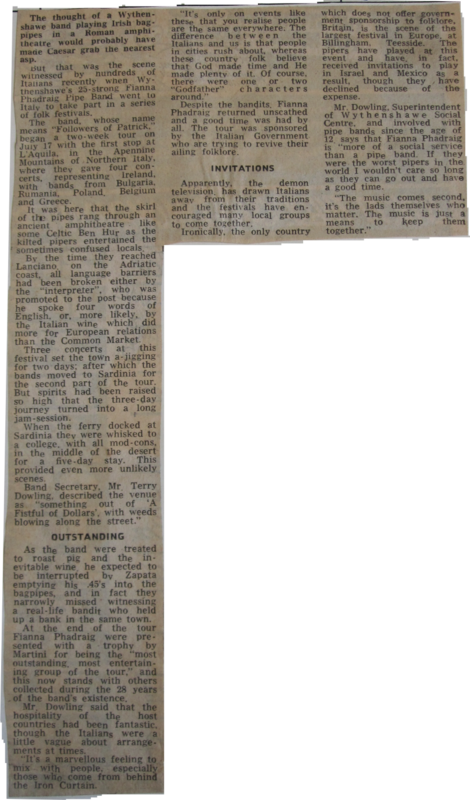 A proud achievement indeed for Mary Rea, and the boys and girls in the Band and Dancers wasted no time in recognising her efforts. 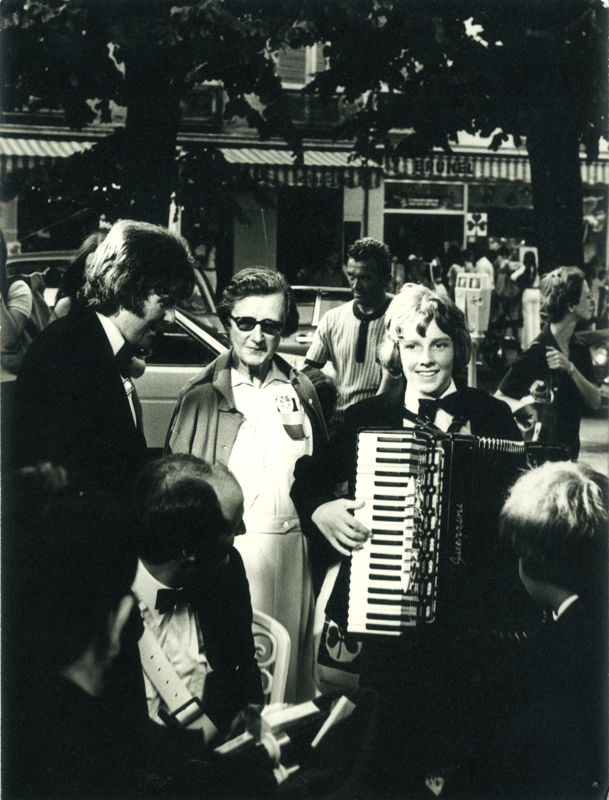 Determined to do her proud, we took our festival quarters in the Rue Thiers and provided numerous performances, both scheduled and impromptu, which quite naturally raised the street's profile and created the buzz. 23 hours later..., we arrived at our destination. Huelva, a coastal town in South-West Spain. We had been booked to take part in the Columbus Festival, held in the town since 1882 in early August, to commemorate the day Columbus set sail from the port of Palos with three ships towards the New World. 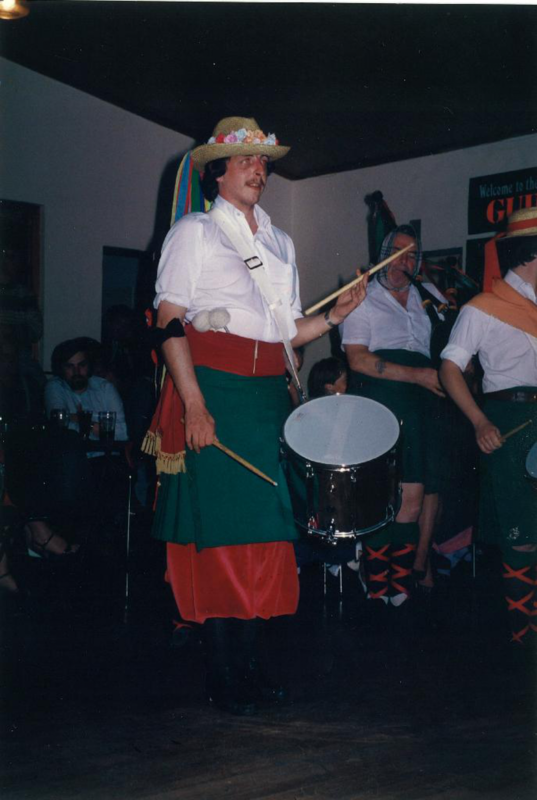 By the time we arrived in Huelva, we were hot, hungry and hacked off, but the festival parade was due to begin within the hour. It was clearly a "no play, no stay" situation, so we changed into our uniforms, tuned our pipes and lined up to take part in the parade, a two-hour amble through the historic streets of Huelva. 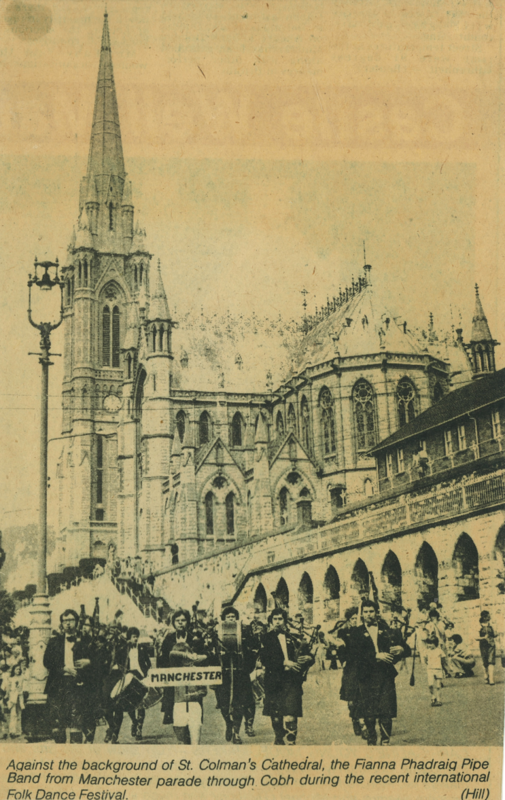 The following day, after a final performance at the festival mass, and a mini-scare when one of our pipers, Ray Lonergan, fainted on parade due to exhaustion, we set off on our 23-hour return coach journey back to Bayonne. Despite the long hours spent on the roads, our trip to France and Spain left us with many fond memories and a multitude of tales to tell. 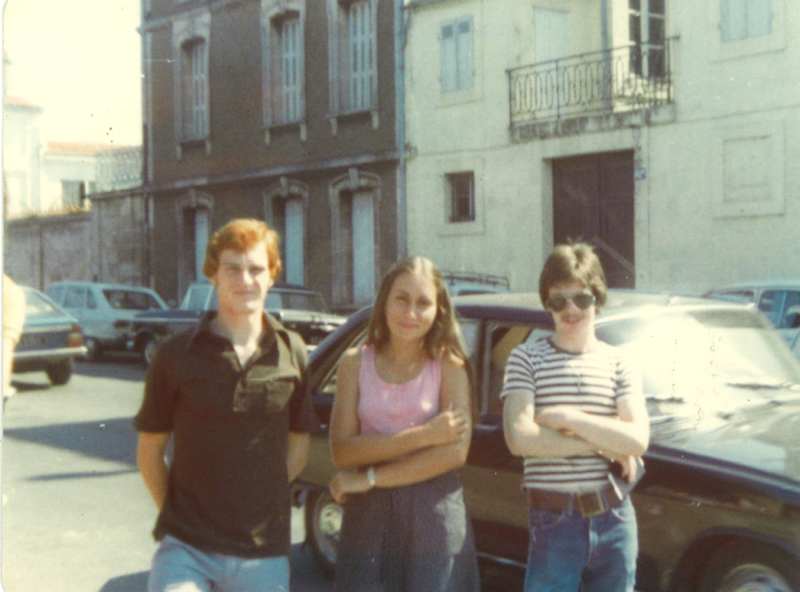 Check out below a selection of photos from France and Spain in 1976. 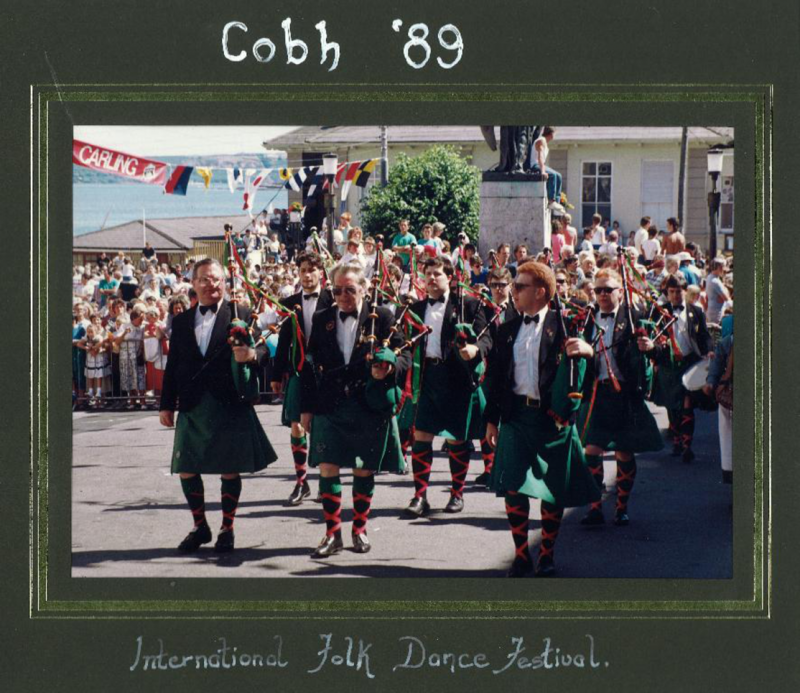 1977 saw the beginnings of the Band's long love story with the Cobh International Folk Dance Festival, in County Cork, Ireland. We travelled over by car, taking the ferry from Liverpool to Dublin, then down the narrow roads to Cobh. 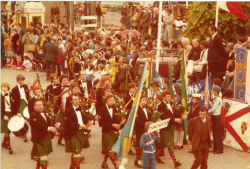 When we arrived in this usually tranquil seaport town on the south side of Great Island in Cork Harbour, we found ourselves amidst the familiar hustle-bustle of an international folklore festival, coupled with a typically Irish sense of hospitality and joie de vivre. 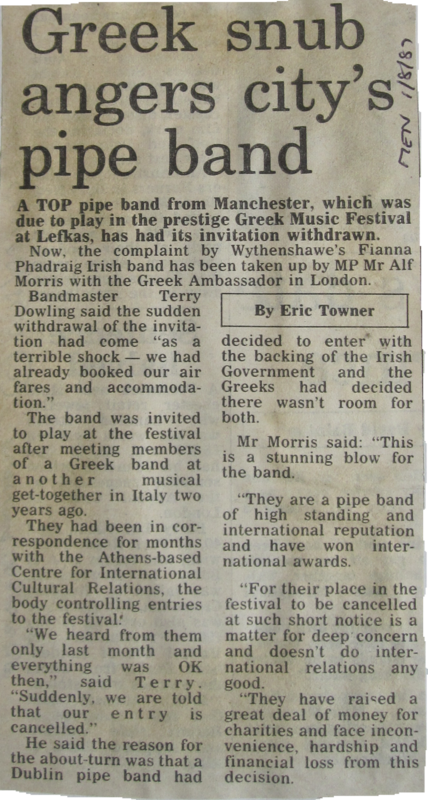 The members of the Band were lodged in various establishments around the town. I remember staying in the Admiral Inn, together with Brendan, Andy Scott and Aidan Sheehan. 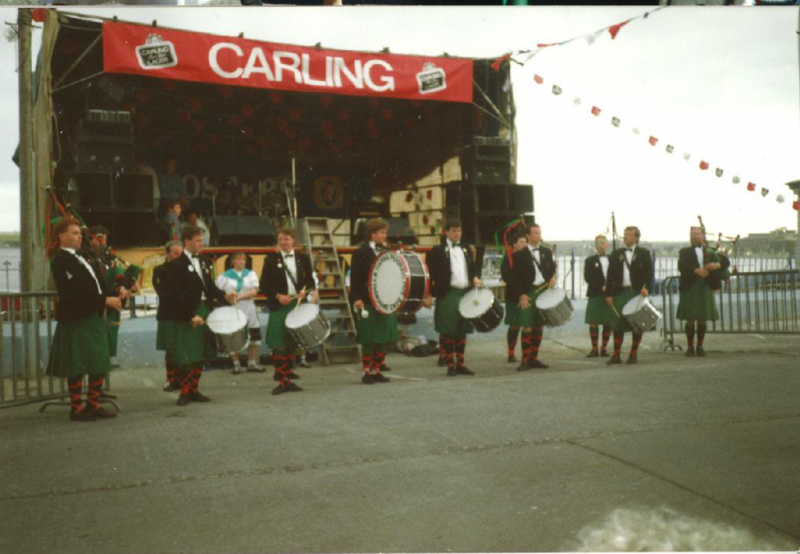 A sizeable contingent was housed in the Westbourne Hotel, located on the seafront, next door to the Festival Club, in the Commodore Hotel. 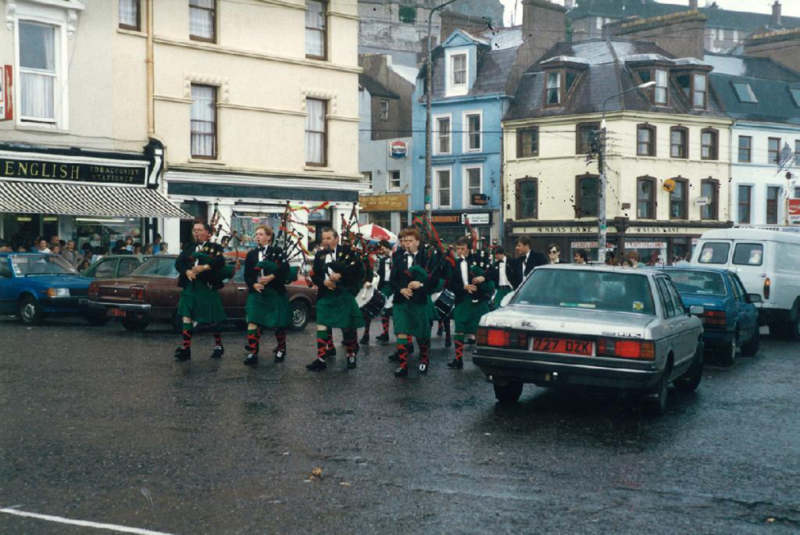 The Band soon took its festival quarters at the Westbourne, which became our home from home at each visit to Cobh. 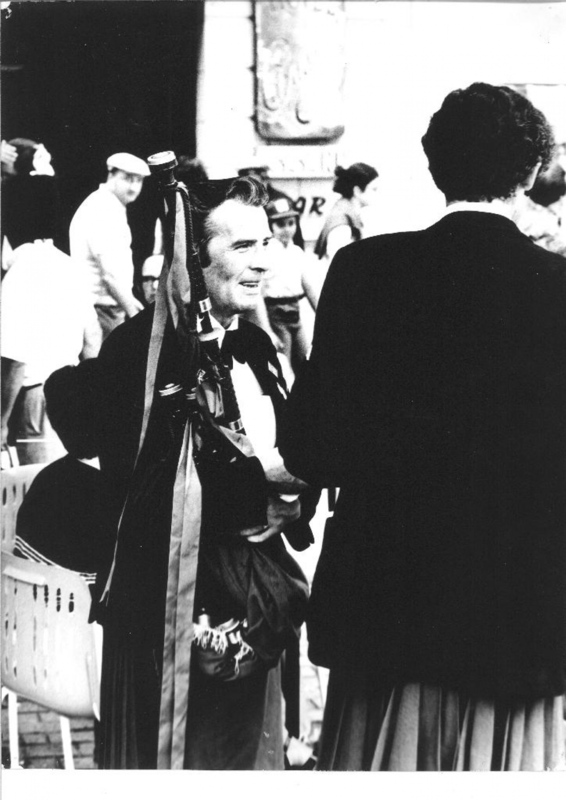 "From all appearances, the night events of the Festival proved also very successful. I recall walking along the beach from C.Y.M.S. Hall after the Artane Boys Band Concert on the Wednesday night, only to find that a number of the Pubs had closed their doors because they had full houses. Later on, I found myself upstairs in the Commodore Hotel, in what at first sight appeared to be a very rough and ready bar, but within minutes of arriving I had struck up several conversations with members of the visiting groups. 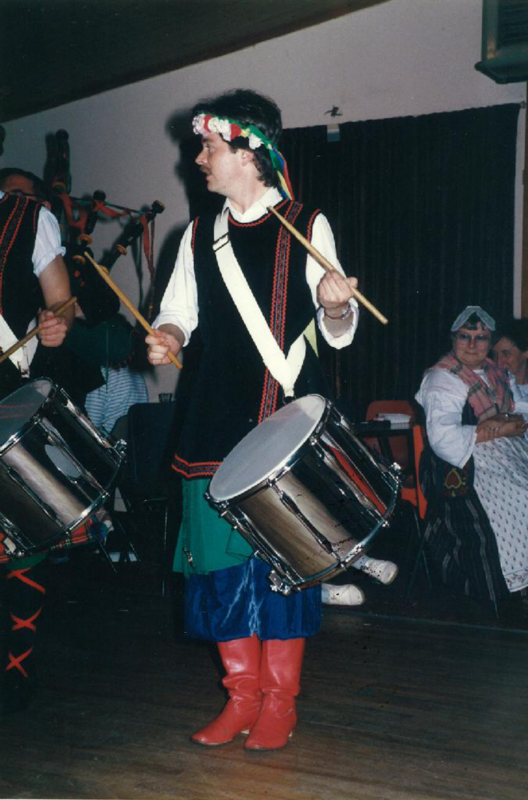 The roll of drums, however, abruptly put an end to the conversations as the Manchester Fianna Phádraig Pipe Band marched into the hall. Now normally I would take exception to the proximity of a pipe band in the open air and I certainly did not want it in an enclosed space. That was until I became fully aware that it was probably, no definitely, the finest pipe playing it had ever been my pleasure to hear. The appreciative audience, made up of locals, folk dancers and strangers applauded the perspiring, kilt swinging musicians to at least half an hour of non-stop playing. Amid the cheers, they marched off, only to be replaced by the Italian Group who played music somewhat like a Palm Court Orchestra, while dancers from each of the countries danced with one another, as well as encouraging the locals to join in. It was then that I realised that the almost make-shift appearance of the hall was an intrinsic part of the whole spontaneous and informal atmosphere. In my own estimation, this was the hit of the Festival. I had heard opinions expressed that there was no "Workshop" for the groups in which to mix and exchange dances and I think that it would be an absolute disgrace to try and arrange what happened so spontaneously this year. I hope that the organisers do exactly as they have done for next year's Festival, and that is to provide the room and let whatever will happen, happen." 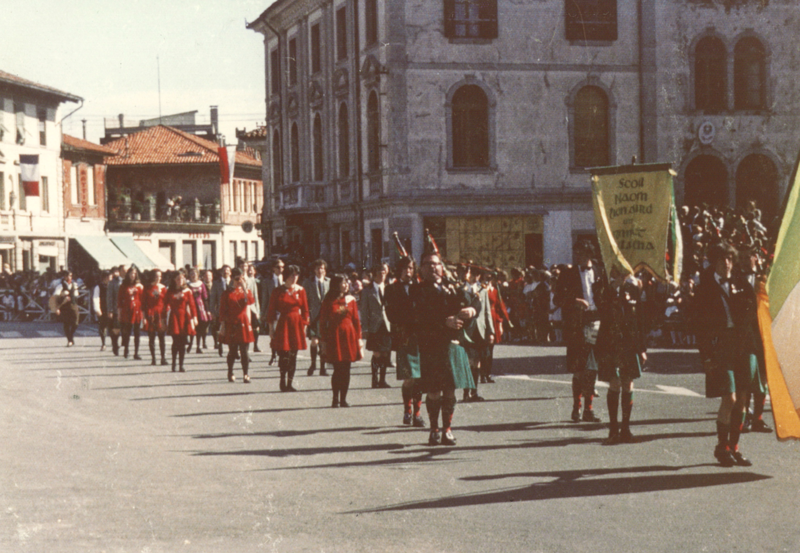 The Italian Group mentioned in the article was none other than the group from Gorizia, whom the pipers had met on their 1970 trip to Tarcento, Italy. A small world indeed on the International Folklore Festivals circuit! 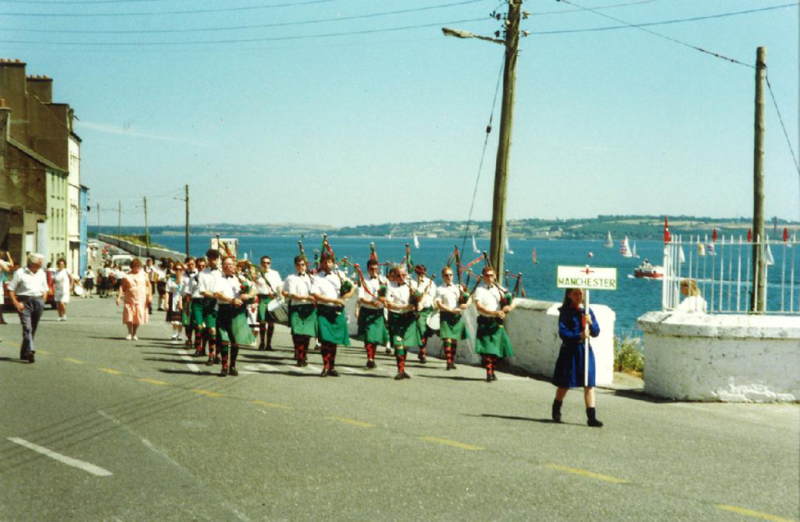 The Band returned to Cobh on several occasions, in 1979, 1985, 1989 and 1991, along with our very own Fianna Phádraig Dancers, finding each time the same spontaneity and warm welcome from our friends in Cobh and from the festival-goers visiting the town. 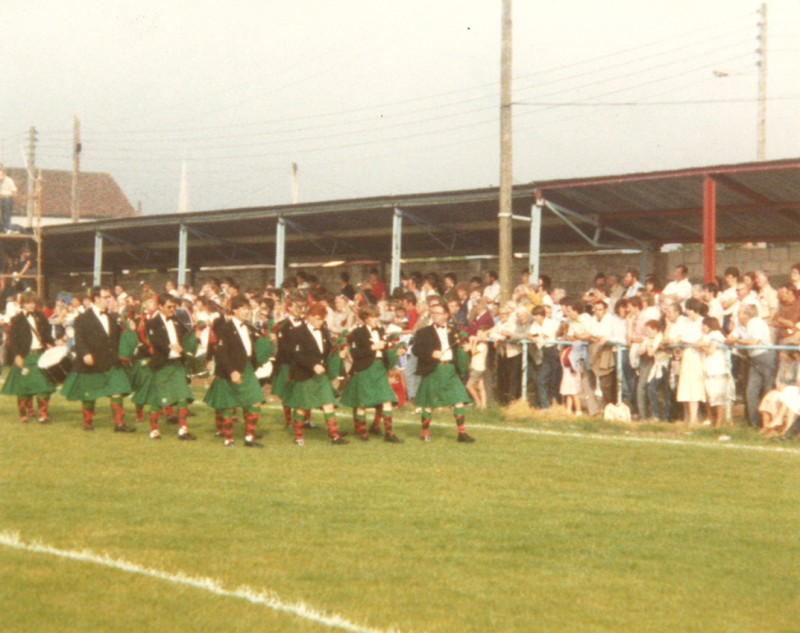 Our last visit to Cobh was in 1991, just a few months after Terry Dowling's untimely death. On our first evening in the town, the festival organisers asked us to attend the official opening of the festival club. 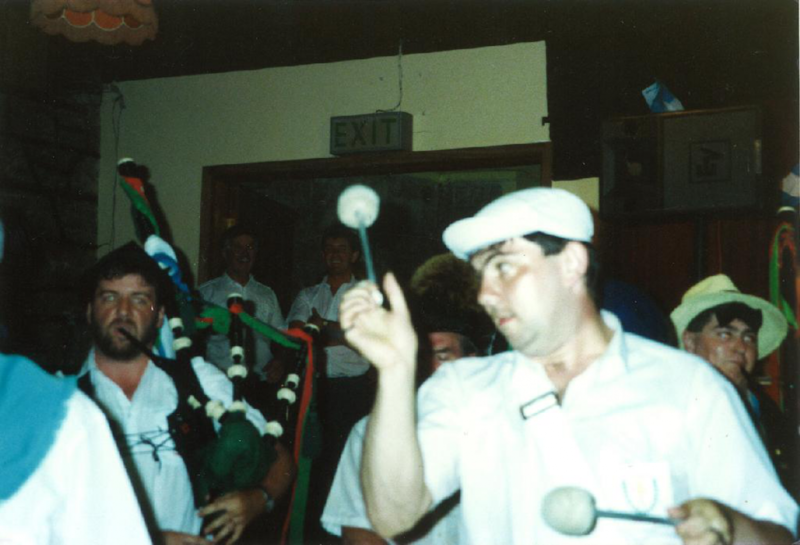 We were all moved to tears when we learnt that they had decided to honour our deceased friend and pipe major by renaming the festival club "The Terry Dowling Festival Club". A fitting tribute to a true friend of the Cobh festival. 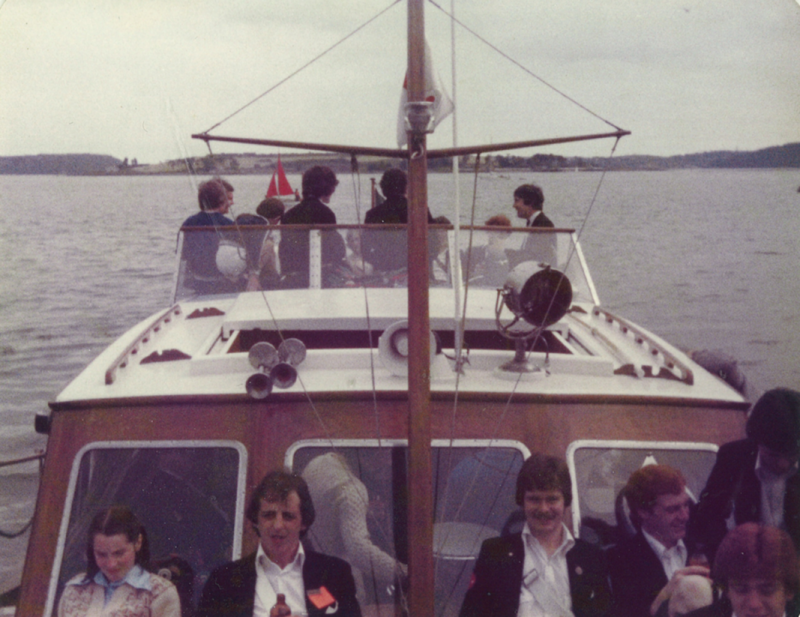 Take a look at the selection of photos below, which illustrate the great times we had in Cobh. Check out below a selection of photos from Cobh. 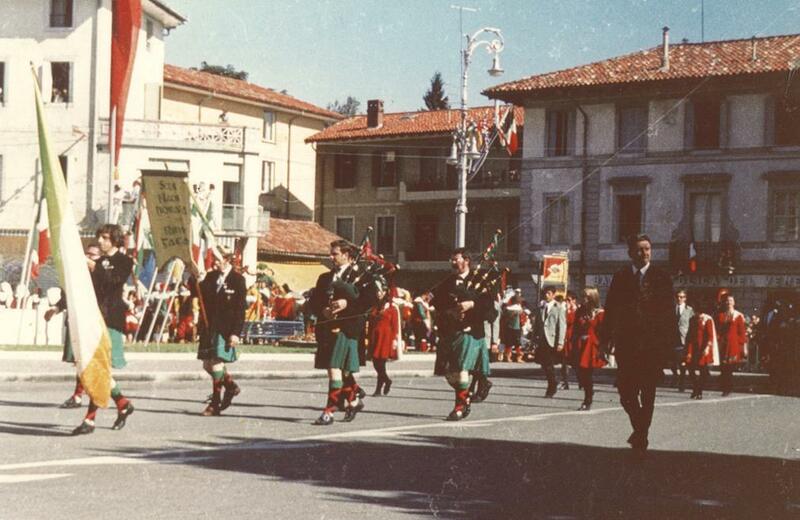 In 1994, the Band took up an invitation from its friends from Gorizia and headed off to Italy for its third visit. 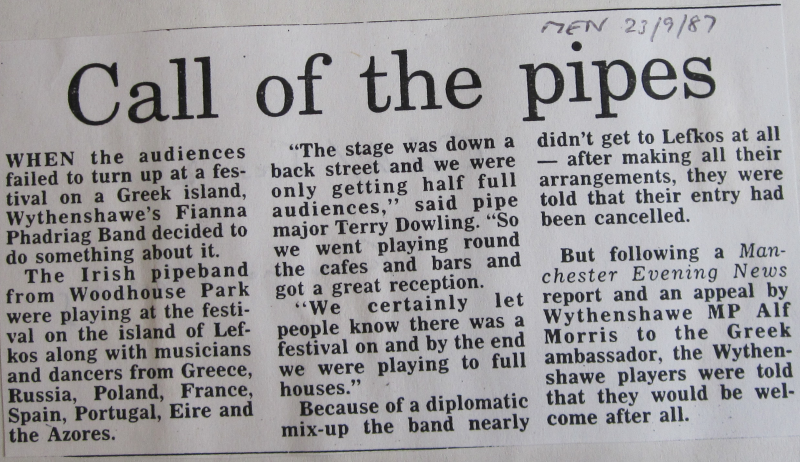 The newspaper article opposite (click to zoom) gives an idea of the atmosphere at the festival. Once again, the communion between the Band and Dancers and their Italian audience was total. 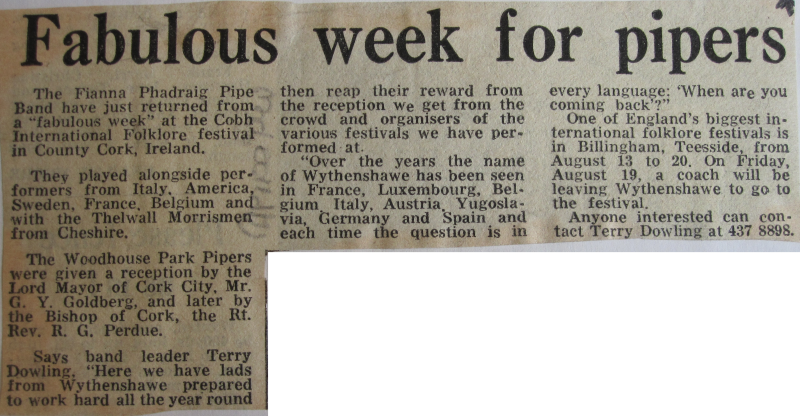 The Band's performances went down to tremendous acclaim and at the end of the tour, Terry was once again presented with a trophy attesting to the Italian public's appreciation of the Irish pipe band from Manchester! 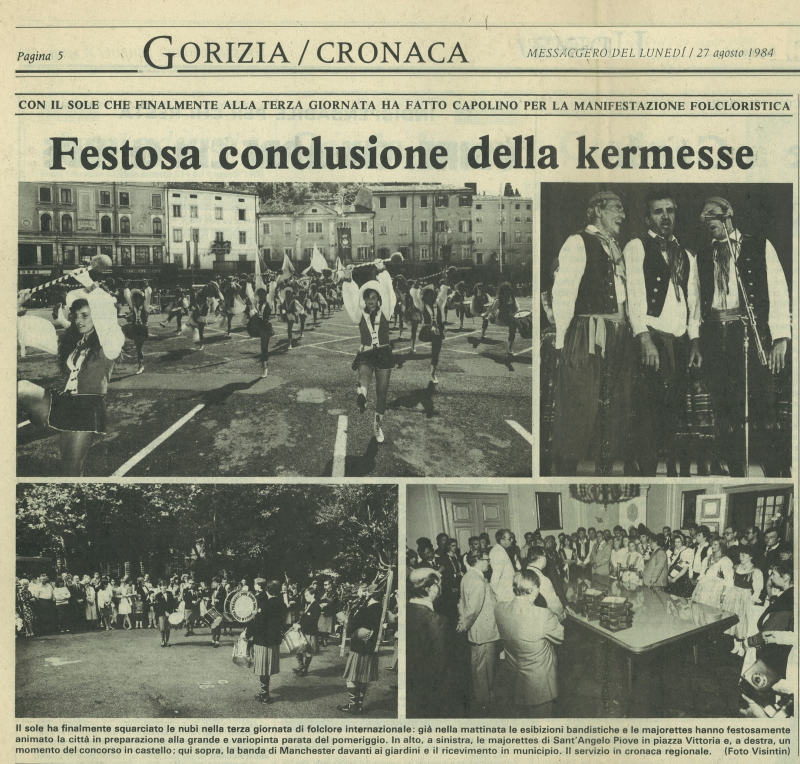 The photo opposite was sent to Terry by the representative of General Candia, the local Carabinieri Brigade's commanding officer, together with a letter congratulating the Band for their performances in Gorizia.